A fragrant and filling southern Thai dish with peanuts and potatoes - a delicious alternative to Thai green curry. Place the potatoes in the slow cooker. Heat a large non-stick frying pan and brown the meat in batches until golden brown, then transferring to the slow cooker. There’s no need to add any oil to the pan as the meat is fatty enough. Add the massaman paste, coriander stalks and ginger to the frying pan, then fry for a few minutes until fragrant. Tip in the coconut milk and bring to the boil. Season with the sugar, lime zest and fish sauce, add the lime leaves if using, then pour the sauce over the meat and potatoes. Cover with the lid and cook on low for 8 hours until very tender. Spoon off any excess fat from the top of the curry, add the juice from half the zested lime and add more fish sauce if needed. 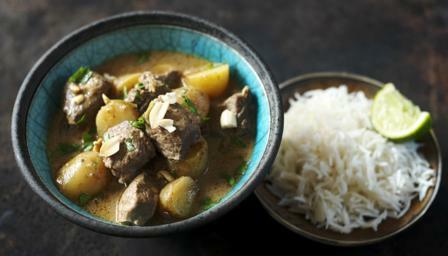 The curry should have a balance of sour, salty, hot and sweet without one flavour dominating. Scatter with the coriander leaves and peanuts, then serve with steamed fragrant rice and the remaining lime in wedges, for squeezing.